About Us - Support Our Soldiers Freedom, Inc.
Support Our Soldiers Freedom, Inc.
Support Our Soldiers Freedom, Inc. (S.O.S. 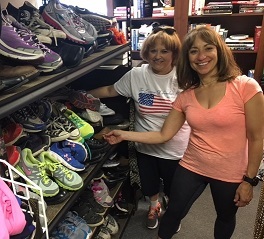 Freedom), a 501(c)(3) nonprofit organization, was established in 2015 by Marilee Papale Shipman, the wife of a retired U.S. Air Force Lt. Col. Marilee saw the financial, physical and emotional challenges active duty military and veterans face every day and decided to make a difference. The objective of S.O.S. Freedom is to provide financial assistance to active duty military and veterans for expenses not covered by military benefits. We hold donation drives and raise money throughout the year to help meet the needs of those who have so selflessly defended our country. 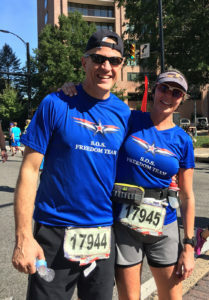 The Essence of Freedom Run, held every Memorial Day is the signature fundraising event for S.O.S. Freedom, Inc.
Disabled Army veteran whose family needed assistance with groceries, utilities and rent when their infant daughter requred heart surgery.